The base after I broke through to the ceiling joist. I look like a zombie from a coal mine. All that’s left is the metal support braces and wooden base. Day two of the chimney removal left me the base of the chimney in my bedroom to remove. My mom came over to spot the ladder for me and help with brick removal. 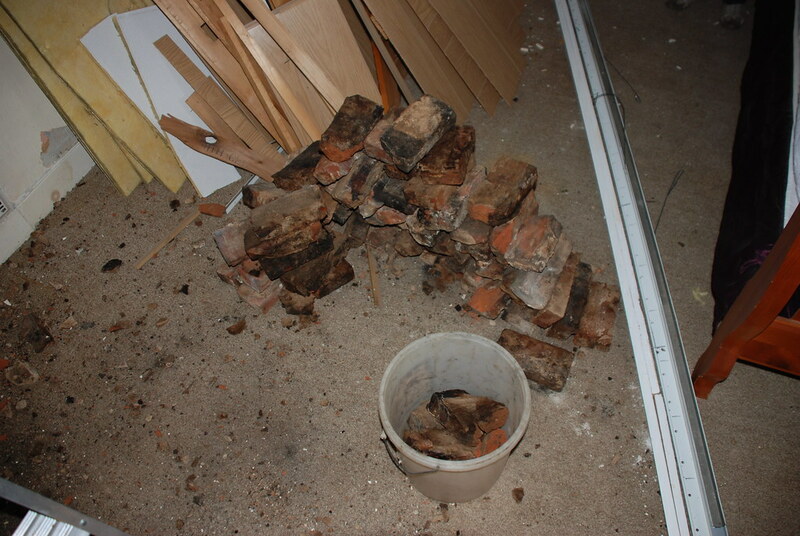 First I climbed back up in the attic to pull bricks out of the chimney base until the base was below the floor joists. There were also a bunch of mortar and brick bits that I had to pick up and put in a bucket so it wouldn’t compress my blown cellulose insulation and ruin it. After that was done it was back into my bedroom to remove debris, ash and coal dust from the chimney base through one of the old flues. 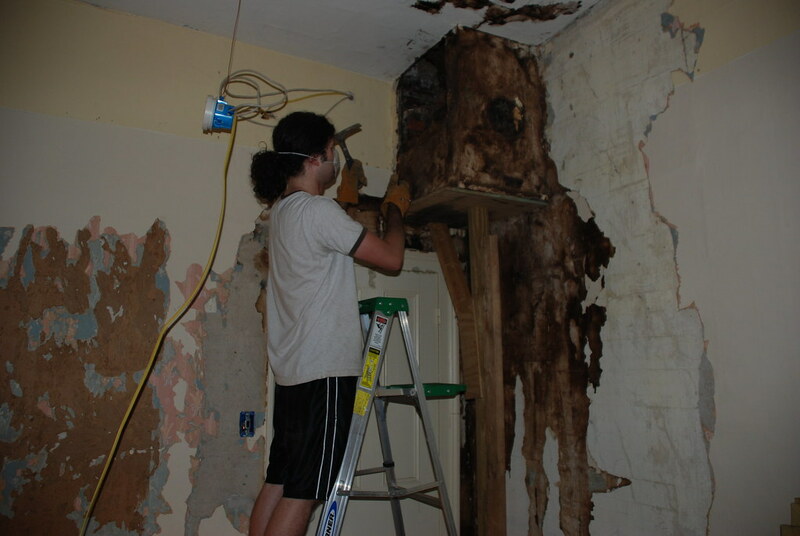 I then had to hammer all of the plaster off the base to expose the bricks. If the plaster on the bedroom walls was as durable and strong as the plaster on the chimney base I wouldn’t be putting up new drywall! That stuff was very strong! 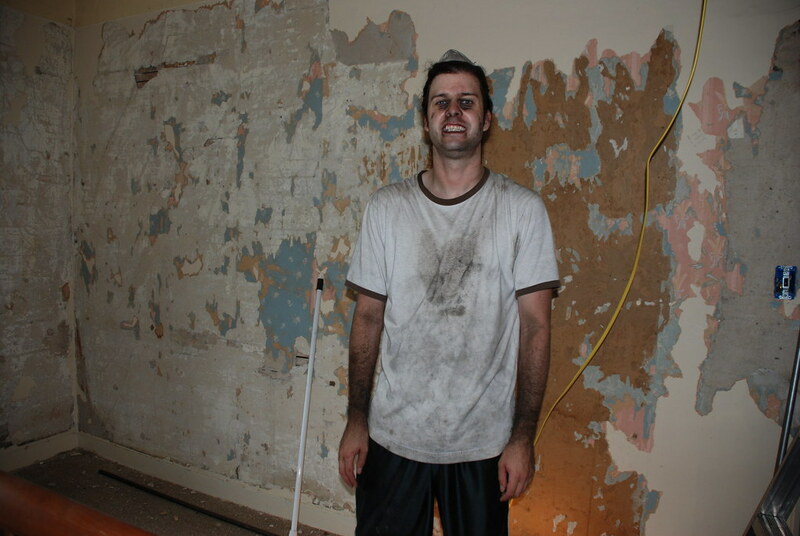 After the plaster was off I broke through the base where it meets the ceiling and started knocking out the bricks one by one, handing them off to my mother, and alternating filling a 5 gallon bucket with debris from the chimney. 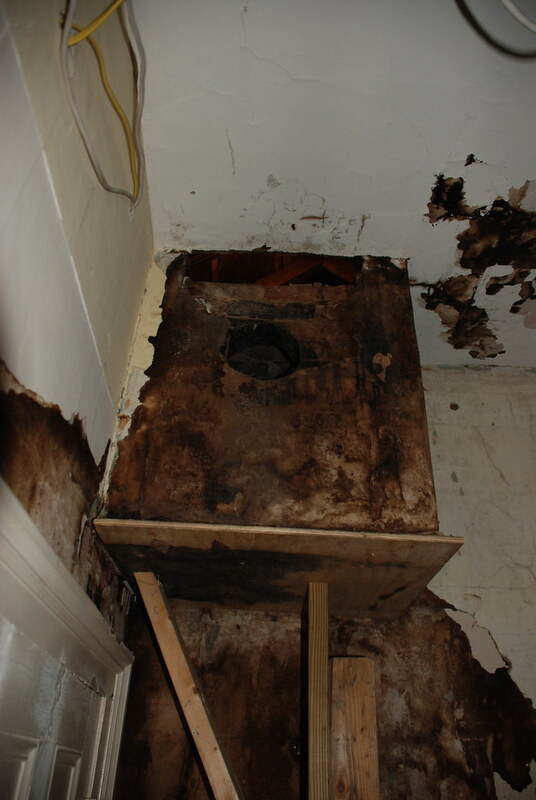 Overall there was about 10 gallons of debris and soot settled into the bottom 3 feet of the chimney. 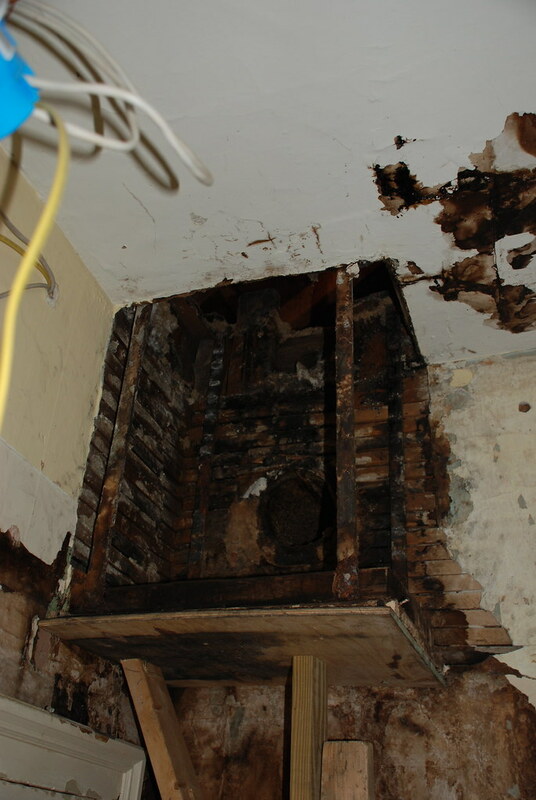 This part of the chimney was not as deteriorated as the upper part, so it was a little slow going. It took us three hours and multiple trips up and downstairs to dump our debris buckets and carry down bricks. My upper body is pretty sore, but it was a great workout and I’m so relieved it’s done! Now I have to move on to drywalling, painting and then I’ll be done. I have someone coming soon to address the wiring in the hallway and get it all up above the ceiling. I’m hoping this can all be accomplished in the next several weeks before I go back to work, but I’m realistic enough to know it might take longer! Thanks a lot Goosefairy! It was dirty work but very rewarding to get it done!